Selling for $22.51 0 0 Like this product? Made of high quality steel wire. Its open design allows air to circulate around fruit for even ripening. Is lightweight and sturdy. Lightweight yet strong enough to hold plenty of fresh fruit, a beautiful accent to any kitchen. 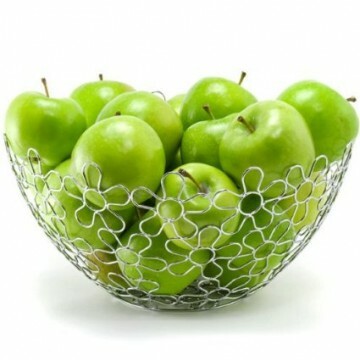 Lightweight yet strong enough to hold plenty of fresh fruit, this contemporary open wire fruit basket gracefully combines form and function for a beautiful accent to any kitchen. Made of high quality steel wire. 6" H, 11" diameter. Open design allows air to circulate around fruit for even ripening. Lightweight and sturdy. Made of high quality steel wire with a shiny chrome finish. Open design allows air to circulate around fruit for even ripening. It has worked great. The flower design allows the air to move through the fruit too. My daughter has asked to take it home, because its very pretty. Great for creative people with endless ideas. This is a fun bowl which gave me so many ideas beside fruit. For Halloween I filled it with small pumpkins. For Christmas I thought I would fill it with decorative Christmas ornaments. Will be fun to use all year round. Bought this for a present over a year ago. Bowl looks good and it is used often. Good price and quality. good looking, well made. it is stainless steel and easy to maintain. i have some other stainless steel product that I have to wipe it dry right away. this one never gives me any trouble.